Had George Lundeen ‘71 participated in a Stations of the Cross liturgy before he began producing bronze sculptures depicting along Jesus’ journey to the Crucifixion? When approached by a friend to assist with a larger-than-life Stations of the Cross for the new Cloisters on the Platte spiritual retreat center near Gretna, Nebraska, he decided to learn more. 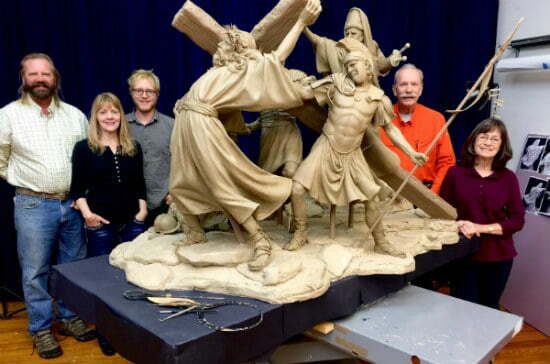 Pictured is a model of “Station 2: Jesus Takes Up His Cross.” Shown (from left): Mark Lundeen, Bets Holland Lundeen ’76, Joey Bainer, George Lundeen ’71 and Ann LaRose. Lundeen is among the 10 sculptors who produced 60, seven-foot bronze sculptures installed along a 2,500 foot walkway. Each of the 14 stations provides a snapshot of the events on what Christians today commemorate as Good Friday. The Stations of the Cross, as well as the multi-million dollar facility, were financed by Joe Ricketts, founder of TD Ameritrade. From his Loveland, Colorado, studio, Lundeen and four other sculptors worked as a team, revisiting as many depictions of the largely Catholic tradition as possible. Although they studied some three-dimensional renditions of the Stations of the Cross, painters such as Raphael and Titian ultimately provided the clues to sculpt six stations in nearly four years. “The Renaissance artists could put more into painting than they could sculptures,” Lundeen said. The team — including his brother Mark and sister-in-law Bets Holland Lundeen, who also attended Hastings College — realized the stations embody more than Jesus’ experience. “Jesus is at the center of each station, but [the stations] had to tell more of the story,” said Lundeen. Their depiction of “Station 5: Simon Helps Jesus Carry His Cross” demonstrates how they put the revelation into practice. It includes Simon of Cyrene’s wife, as well as his young sons, Rufus and Alexander, who later because well-known early Christians.